England 215 and 6-326 (Ian Bell 95*, Kevin Pietersen 64, Alastair Cook 50, Mitchell Starc 2-66) leads Australia 280 (Ashton Agar 98*, Phillip Hughes 81, James Anderson 5-85) by 261 with four wickets intact. A true spirited batting by the prolific scorer, Ian Bell, well assisted by Stuart Broad and other batsmen, took England to a commanding position vs. Australia. England managed 215 runs in their first innings followed by 326 for the loss of six wickets after 133 overs. Australia scored 280 runs in their first innings before they were bowled out in 64.5 overs. The third day’s play finished on Friday, July 12, 2013, at Trent Bridge, Nottingham. Earlier, the hosts started the day at 2-80 in 43 overs, their captain Alastair Cook and Kevin Pietersen were at the crease with 37 and 35 runs. 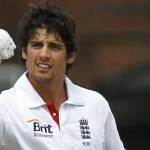 Cook was a bit watchful whereas Pietersen hit three boundaries and achieved his 31st Test fifty in the 50th over. The score was enhanced to 121 when Kevin Pietersen was clean bowled by James Pattinson for 64 and was replaced by Ian Bell. The latter went off with a couple of fours as Cook reached his 30th Test half century in the 59th over. Alastair Cook was caught in the very next over by Michael Clarke in the slip for 50 as Ashton Agar celebrated his maiden Test wicket. 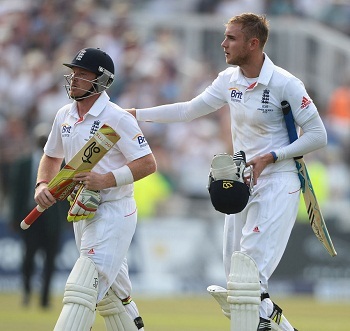 Jonny Bairstow joined in next with Bell and the batsmen were unable to hit any boundary in the coming seven overs. The duo crept to 164 in 76 overs as Bell added another 2 fours to his credit in the next one. Bairstow was caught behind by Brad Haddin off Agar for 15 from 62 balls when the total touched 174. Matt Prior came in next and escalated the run rate by hitting 3 fours in the following overs while the score went past the 200 runs mark in the 89th over. Prior opted to attack and dispatched few fours but was caught by Ed Cowan at midwicket off Peter Siddle for 31 from 42 balls with 6 fours. The sixth wicket fell at 218 and it looked like Australia would come back in the game when Stuart Broad appeared in the park. Ian Bell got another Test fifty in the 97th over and surpassed 6000 Test runs in the next one. 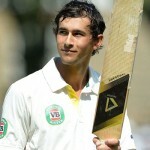 Broad tasted his first four on the 18th ball he faced as Bell kept on consolidating at the other end. The boundaries dried out again for at least 11 overs and Broad got his second four in the 112th over. He survived two overs later when his difficult catch was missed and Bell was successful in getting another four in the 117th over. The pair remained vigilant until the close of the play and sent the ball out of the fence few times. The home side piled up 326 runs in 133 overs at stumps whereas Ian Bell was five runs short of his 18th Test ton and Stuart Broad was batting at 47. England has taken an overall lead of 261 runs and with the two composed batsmen at the crease they can extend their lead between 350 -380 runs mark whereas Australia will face an uphill task to win the match.